Part of the presentation was a cooking demo where I taught everyone how to make Chia Jam! We used Cuties Clementines to make a Honey Clementine Chia Jam! Blend all ingredients together & let sit (or do a Q & A) while the chia jam gels. We served it with crackers & chatted for a while! 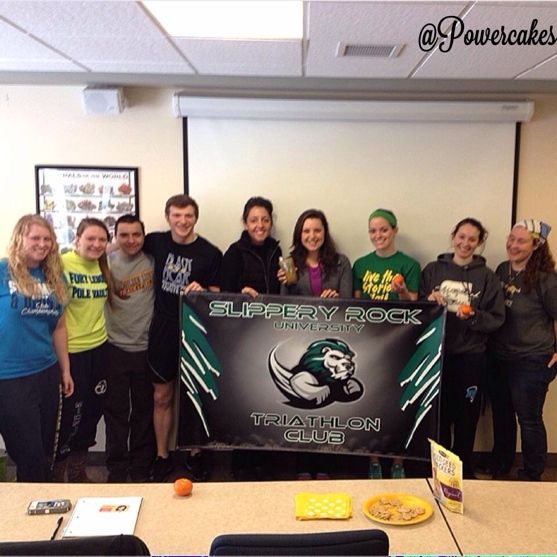 Loved this group – so fun to hang out with! After the morning – it was time to grab lunch with my girl Jen! We went to our favorite place – The Brewery! 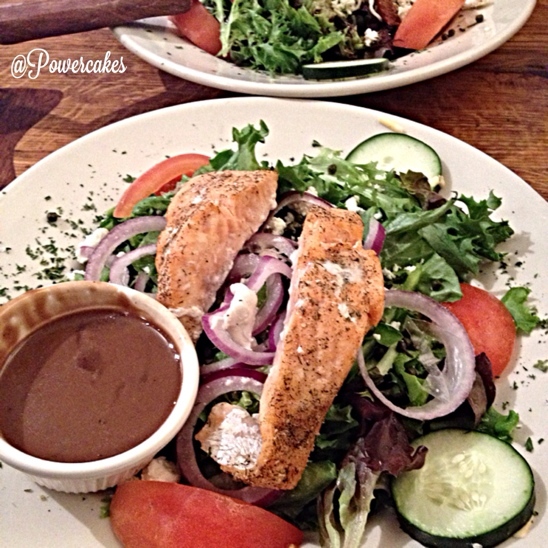 Salmon Salad over feta, veggies, capers, & the best Balsamic Dressing – everrrrrrr. Then I was extra spoiled when Jen made me some Homemade hummus to take on the road! She is the best. 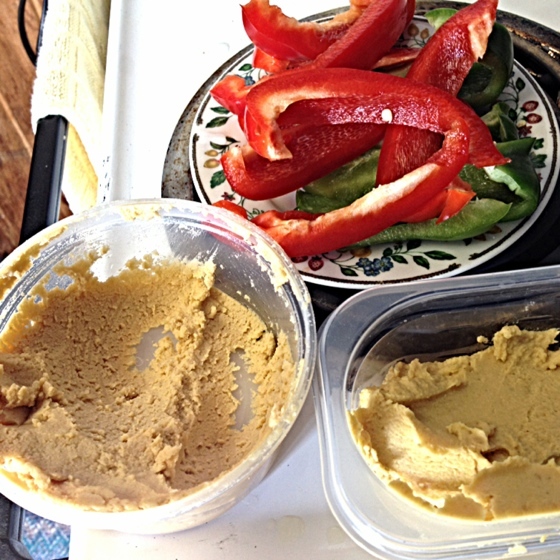 She even made homemade Tahini to make the hummus! We both couldn’t resist to instantly dig in with some peppers. Yum, thank you Jen!! So after I came back after lunch, I took a nap…woke up almost 3 hours later feeling 10 times worse than that morning. Merp! But hey, we can’t always control when colds come on so I’m taking it easy and listening to my body for sure. 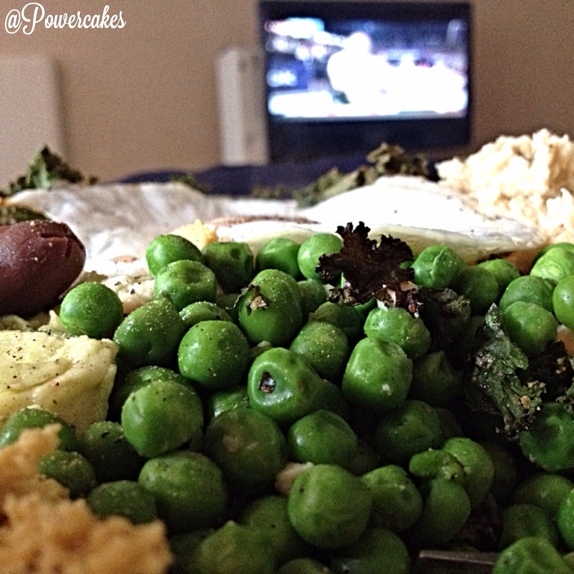 It’s funny, for dinner last night all I wanted & craved was fats … I piled on some baked kale, cooked peas (cause I love them a lot), dippy egg, olives, baba ghannouj, & some of the Curry Hummus that Jen made me. I cuddled up & watched the 2013 CrossFit games on ESPN & drank tea like it was my job. Taking it easy means extra time to share a recipe that I’ve been meaning to share! A week or so ago, the boy & I had a dinner date night and I whipped up a new fish recipe. I was inspired by a new product I’ve been wanting to try out – Quinoa Polenta! 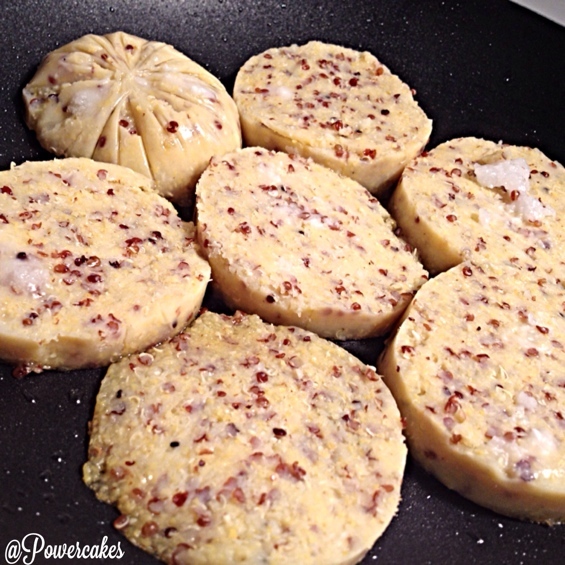 I see it often in the store & papacakes loves polenta – but I had yet to try Quinoa Polenta! It’s basically organic corn meal & quinoa with some spices that you can cut into discs, heat, & enjoy. Which is exactly what we did with some coconut oil in a medium heat pan. Cook on each side for 6-8 minutes until nice & crispy! Delicious. 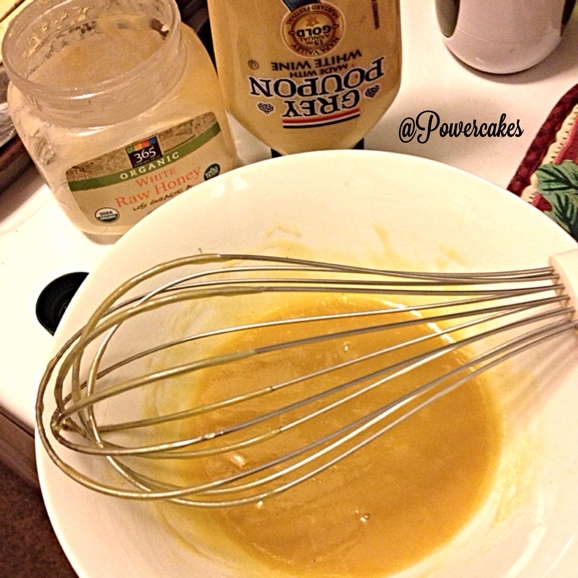 While those cooked, I made some Honey Mustard Sauce. Mix all ingredients together & let sit until ready to eat! That simple. 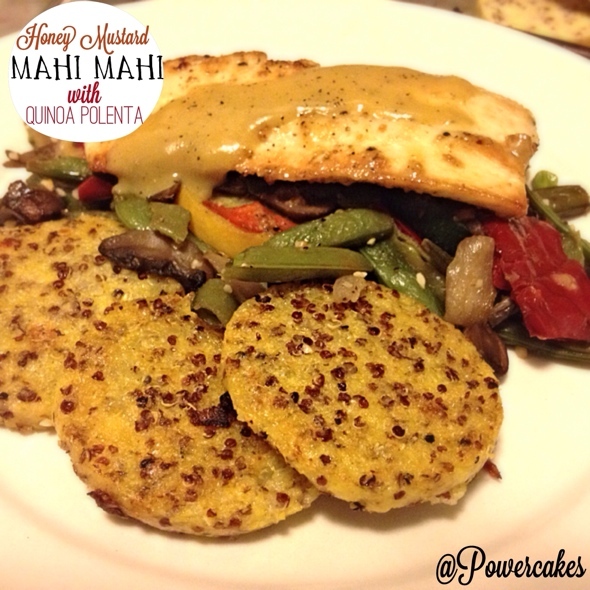 Once the quinoa is crisped & the Mahi Mahi is cooked…. Fresh Wild Mahi Mahi (Or defrosted Frozen) in a medium heat pan with 2 TB or so coconut oil, minced garlic, & a little bit of mustard – heat on both sides for a few minutes until cooked through. Add your pick of roasted veggies (350 degrees for about 35 minutes on a cookie sheet with oil & sea salt & pepper) to the bottom of the plate, then top with fish, Honey Mustard Sauce, & A side of Quinoa Polenta and you’re in for a party in your mouth. We paired a white wine with this dish – went really well together! Get your veggies cut & put onto a pan. Throw into the oven & let cook. Get your Fish & Polenta going in the pans on the stove. While you’ve got the veggies in the oven, fish & polenta in pans, make the mustard sauce. Then once it’s all done – plate it up & eat! You can find Chia Seeds for the Chia Jam & Coconut Oil on Iherb.com with coupon code XUG228 at checkout! This dish would also go great with TEA! 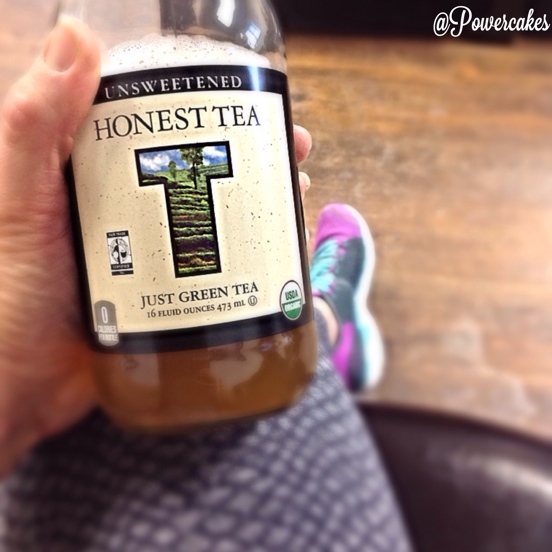 Especially Honest Tea – I love their unsweet green tea with dinner. Before I head off to take a nap I wanted to make sure I announced the HONEST TEA GIVEAWAY WINNER! Thank you to everyone who entered & Honest Tea for hosting the Giveaway! Congrats to Julie & also loved your comment! 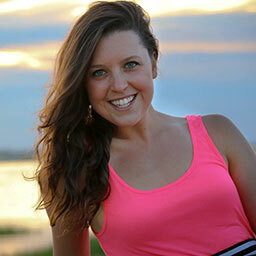 I think taking steps towards a happier YOU is so key to your own wellness. Living life in a balance that works for you is something I love to see. Please e-mail me Kasey@powercakes.net with your information for delivery! Thank you. 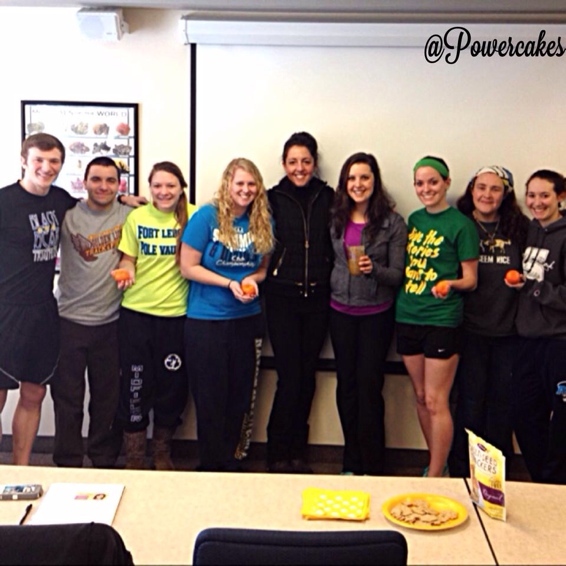 I also wanted to say a BIG THANK YOU to Honest Tea for donating tea for the Power Up Your Marathon Night on the 18th! They were so sweet to meet with me Friday night and donated cases of Tea for the event. It really means a lot & I hope you to see you guys there on the 18th! 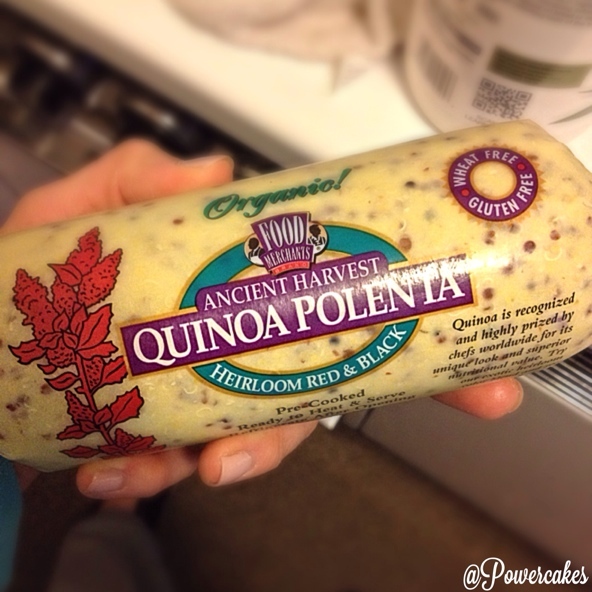 Have you ever had Quinoa Polenta or tried a new product lately?? Yummy! That all looks wonderful! Must find that polenta mixed with quinoa!!! I love that brand of polenta, I will definitely have to be on the lookout for the quinoa one. I hope you feel better soon, girl!